The Green Man is a powerful archetype, an untamed mysterious figure often depicted with his semi-human foliate face entwined with plants and leaves - often growing out of his mouth. He is an ancient primeval character, representing the fierce verdant force of nature, the woodlands and densely entwined thickets that once covered the land. The Green Man is often included in stone carvings by artist and stonemasons: his enigmatic image adorns the crevices and walls of medieval cathedrals and churches all over Europe. Similar images occur in many cultures, representing the vegetation deity, the spirit of the trees plants and foliage. Our oldest Celtic example dates to the third century BC, where he appears on an Irish obelisk, perhaps the mythic Derg Corra - the Man-In-The-Tree. He is well known throughout the British Isles by many names, such as Green Jack, Jack in the Green and Green George. 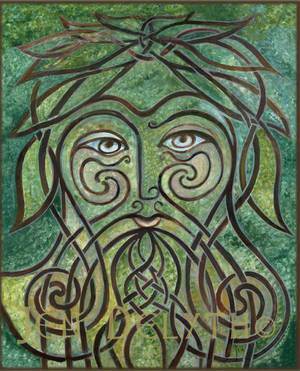 Myrddin Wyllt - Wild man of the Woods - is a Welsh sixth-century bardic visionary, a mad wild man. He is both an historical and mythic figure who inspired many poems and prophetic legends from the Dark Ages onward. The life of Myrddin Wyllt became the basic of the great iconic magician Merlin who later figured in the romantic twelfth-century Arthurian legends.